ReMatriate, the social campaign born out of the need for “image sovereignty for Indigenous women” will be focusing on First Nations women in their relationship with water in the exhibition qaʔ yəxw - water honours us: womxn and waterways opening next week in the Bill Reid Gallery. The multidisciplinary exhibition features video, photography, carving, printmaking, beading, and performance by nine artists affiliated with various Indigenous peoples of the Northwest Coast and the Interior of British Columbia. “We didn’t seek out artists. We let the artists come to us. We chose from a really excellent selection of artists. We would have wanted to include more if we had more space … but we decided to keep it smaller,” said Denver Lynxleg, one of four guest curators for the exhibition. An open call went out on social media for the submissions. Initially six artists were to be chosen but the calibre of the work pushed Lynxleg and fellow guest curators Tsēmā Igharas, Tiffany Creyke and Angela Marie Schenstead to choose nine. 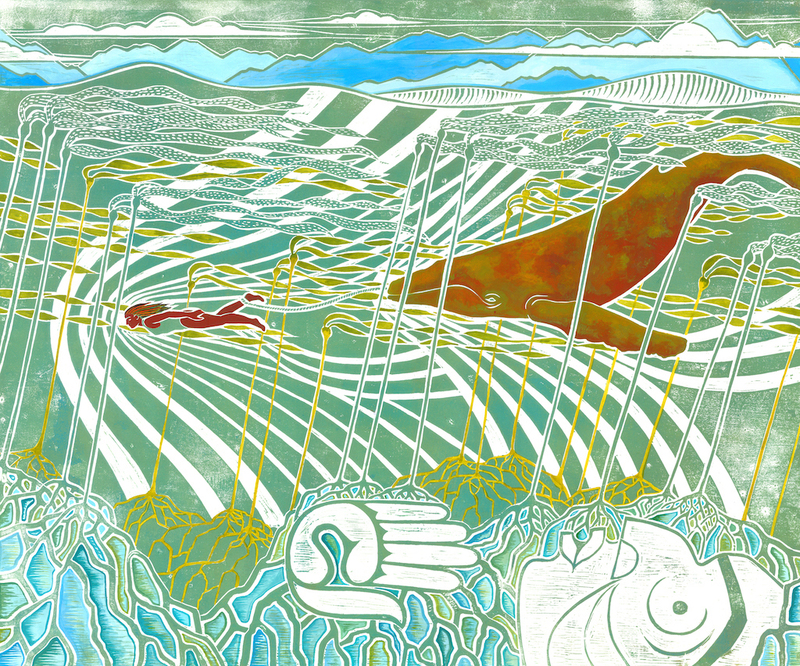 The exhibition looks at how women are connected with the water as child bearers, healers, doulas, and other roles key to Indigenous matriarchal societies of the Northwest Coast. “We’re situating ourselves within upholding the past and moving forward these conversations that are really about centring matriarch, creating space for people to interact with Indigenous people, especially our matriarchs, in different ways,” said Lynxleg, who is Anishinaabe. The curators worked collaboratively with the artists accommodating any changes the artists required. Artists whose work will be showcased are Richelle Bear Hat (Blackfoot/Cree), Krystle Coughlin (Selkirk), Lindsay Katsitsakataste Delaronde (Mohawk), Alison Marks (Tlingit), Dionne Paul (Nuxalk/Sechelt), Kali Spitzer (Kaska Dena), Marika Echachis Swan (Nuu-chah-nulth), Carrielynn Victor (Sto:lo), and Veronica Waechter (Gitxsan). The exhibition will also feature Audrey Siegl an important contemporary Water Keeper, who is an advocate and activist from the region. “This helps to draw attention to the important work that Indigenous advocates and Water Keepers do all across Turtle Island,” said Lynxleg, noting that is one of the timely message she hopes non-Indigenous visitors take from the exhibition. For Indigenous patrons, she hopes they see the respectful way the exhibition has been undertaken, including the use of the Musqueam language in the title, and understand that the knowledge of Indigenous peoples in the territory is being elevated. This is the third and largest exhibition to feature the work of the ReMatriate Collective. Previous exhibitions were held at Arts Underground in Whitehorse, Yukon, and at the Morris and Helen Belkin Art Gallery at the University of British Columbia. The ReMatriate Collective, which was formed in 2014, came together as a means for women “to be able to say we have the right to our own stories and our own images and we can show them in the best way. Take authority back of how our images can be used or set up positive reference point for people to move forward from,” said Lynxleg. At that time, she says, designers were taking Indigenous fashions and claiming them as their own all the while presenting Indigenous women as “hyper-sexualized” and in derogatory terms. “There were layers of ignorance that sat within that work and it was being shown on such a public scale. I think a lot of Indigenous women at the time thought this was enough. We had enough of these really damaging images and portrayals of Indigenous people that sometimes non-Indigenous people think they get to play, especially with fashion, they get to play with Indigenous themes or our bodies or our images,” she said. The power given to women is represented in the name of the collective, ReMatriate which was coined by collective co-creator Jeneen Frei Njootli and is a play on the term repatriation (a non-Indigenous concept), which describes the return of cultural belongings to their rightful communities. “In the way we chose to spell it we are putting an emphasis on Matriate as we want to draw attention to the important roles of Matriarchs in our communities,” said Lynxleg. qaʔ yəxw - water honours us: womxn and waterways runs from April 10 to Oct. 2 in the Bill Reid Gallery in Vancouver.